Cases of breast cancer, the most common type among Costa Rican women, increased 63 percent between 2000 and 2013, while mortality rose 43 percent in the same period, a group of 31 specialists from public hospitals reported Thursday. They also disclosed data from the Health Ministry stating that, on average, 1,100 women are diagnosed with breast cancer and some 250 of them die each year. These figures are the highest in Central America and fourth in Latin America, the group reported. The group’s coordinator, Gonzalo Vargas, in a public presentation at the Costa Rican Doctors’ and Surgeons’ Association said the main goal was reaching consensus on the drafting of recommendations for improving the prevention, diagnosis and treatment of breast cancer. Vargas said this plan can help a lot, but women’s periodic health screenings and the support of experts is just as important. 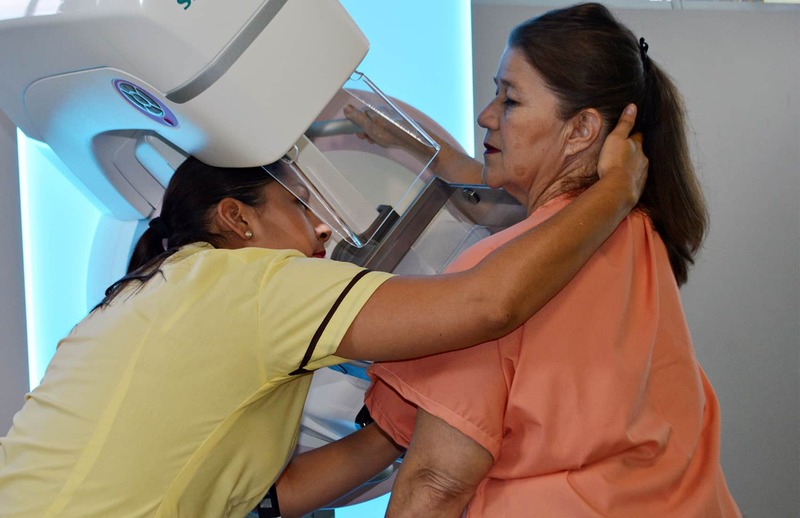 Oncologist María José Ibarra, one of the researchers, said that currently there is no consensus here or among international experts about key aspects such as the appropiate age for undergoing the first mammogram. One of the reasons is that cancer behaves differently among geographical and age groups, she said. “Some specialists believe women should undergo annual screening mammography beginning at age 40, while others believe they should undergo a screening every other year starting at 50,” she said. Physicians usually do not recommend screenings before age 35, as breast tissue at this age is still very dense and that can prevent an accurate diagnosis. “But this could change if there are hereditary factors,” she said. There are also habits and conditions that can increase cancer risks, such as smoking, drinking, being overweight or having a sedentary lifestyle, Ibarra said. Biologist Carlos Santamaría explained that every woman is biologically different, but he concurs that hereditary factors play a key role. He said that, for example, if a woman gets a breast cancer diagnosis before age 40, and she has a daughter and a son, a physician likely will recommend that the daughter undergo her first mammogram at age 35. He would also recommend that the son undergo regular screenings, as risks of breast and other types of cancer increase among all children — including males — of mothers with a diagnosed cancer. Breast cancer cases among men represent less than 1 percent of the total, but research from the Social Security System, or Caja, found that the hereditary factor also increases risks of suffering other types of cancer such as stomach or colon cancer, Santamaría said. Though the absolute number of all types of cancer deaths in Costa Rica has increased slightly over the past 15 years, the rate per 100,000 inhabitants has declined 17 percent, Caja reported in August. The report includes a list of 19 recommendations for top officials of both the Caja and the Health Ministry. Among others, it calls for increased access for the population to prevention and diagnostic methods and also an increase in cancer research. It also asks for the creation of a national cancer hospital, hiring more professionals and improving diagnosis equipment and procedures at public hospitals. The proposal also calls for improved education programs for young people. Efforts should focus on providing more information on healthy living and prevention habits for elementary and high school students, the document says. The group also calls for the creation of various specific health programs, among them a screening program for young women, another for women with hereditary risks of cancer and also psychological programs to help diagnosed patients.